Bareboat skipper level of competency already means self operation of sailing boat in coastal waters, in other words it means you can be a commander of pleasure craft and obliged to maintain full control for navigating a ship and keeps entire responsibility for all possible consequences. You are real Captain! It is not a level for beginners but you can get it full "from ziro" for two weeks daily combined theoretical and practical trainings aboard of our boat. After completion of the course you are getting not only necessary skills to control a boat under sail and motor those as maneuvering in constrained conditions of marina, sail trimming, basic methods of position fix in coastal waters, weather prediction, knots splicing as well as good seamanship practice skills, but also internationally recognised recreational craft operator (skipper) license from International Yacht Training System. License we provide is recognized by all charter companies of the World, those who offer sailing boat for rent. It means that you can get a boat for rent (bareboat charter) for couple of weeks of your vacation to be full duties skipper on her which ever place you would wish all over the World, to set coastal sailing trips, call at different ports and marinas and drop an anchor in silent distant beautiful bays! - sail area of a boat is not limited. 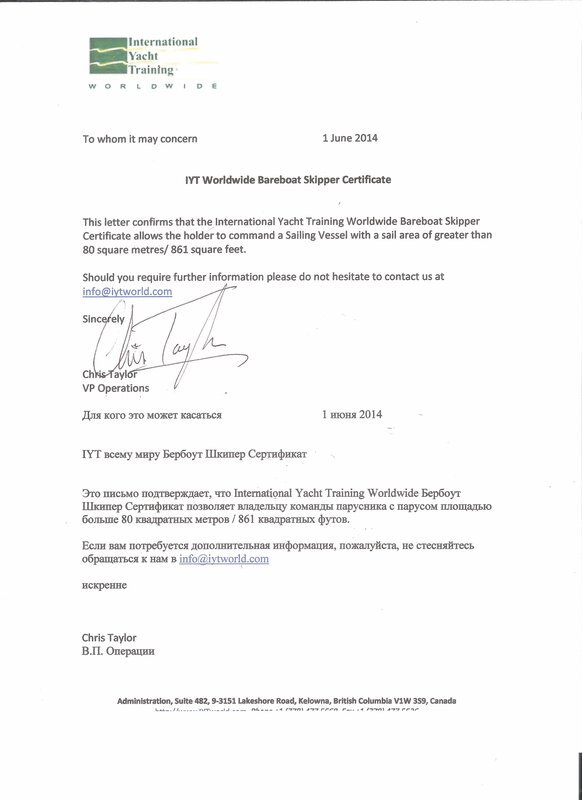 Please find our official iyt documents here. According to latest International Yacht Training requirement, beginning from 7th of May 2018, base International Bareboat Skipper course CAN NOT be provided without applicant has been qualified as VHF radio operator (SRC - Short Range Certificate), therefore since above mentioned date we do provide main skipper's course which INCLUDES SRC course and after successful completion you will get both - Bareboat Skipper and SRC licences. Please note, that prices for International Bareboat Skipper course mentioned on this website are all the time INCLUDE COST of both licences, so you wouldn't be charged with any extras!